Biden did not mention Trump by name when he criticized the president's reaction. Taking the stage to chants of “Run Joe Run” in Youngstown, Ohio, Monday, former Vice President Joe Biden scolded President Donald Trump’s response to the attack in Pittsburgh while setting the stakes of the midterms for Ohio voters. “It’s on our leaders to set the tone, to dial down the temperature,” to add “dignity to our national dialogue,” he said. "Words matter…words from our leaders matter," says Former VP Joe Biden while campaigning for Ohio Democrats. 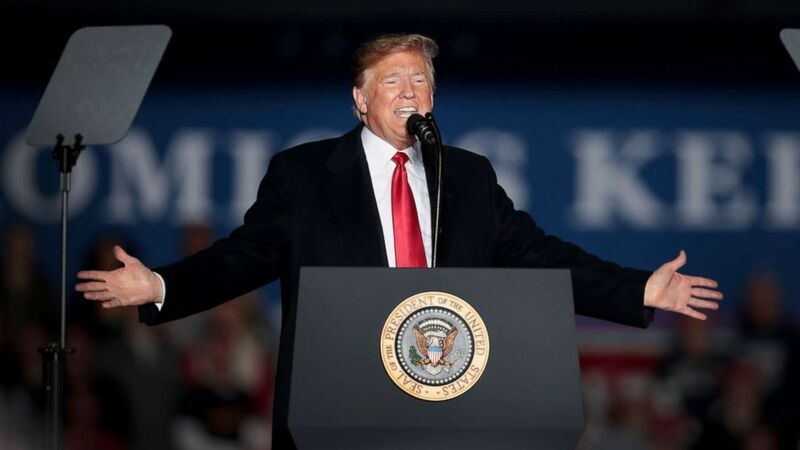 (Scott Olson/Getty Images) President Donald Trump speaks to supporters during a rally at the Southern Illinois Airport, Oct. 27, 2018, in Murphysboro, Ill.
Biden, who frequently met with world leaders as a senior senator and as vice president, warned of dire consequences if Democrats don’t show up to vote next week. “If we don’t turn things around there won’t be a NATO in five years,” he predicted. Biden appeared Monday with local Democratic Rep. Tim Ryan and gubernatorial candidate Rich Cordray - who knew his son Beau while both men served as state attorneys general. “We need men and women of character. You put them in office, we will take back the world!” he said at the end of his remarks, setting off another round of “Run Joe Run!” cheers.